For a long time, my collection held but a solitary stamp from the Caribbean island of St. Vincent. That stamp was featured on the colony’s stamp issuers article back in June 2017. I recently sought to add more and purchased a small “mystery” mixed lot of St. Vincent stamps. However, only three were inscribed thusly. One sheet of eight stamps bore the inscription St. Vincent and the Grenadines (as have most stamps issued since late 1992) and four souvenir sheets read Grenadines of St. Vincent. As a result, I have what constitute two “new” stamp issuing entities in my collection and will prepare profiles on them in the near future. This, I am sure, will lead me to seek out stamps from elsewhere in the chain; available entities include Bequia, Canouan, Mayreau, Mustique, and Union Island plus a few others that don’t meet the Scott catalogue listing criteria and so are not listed there. We’re not even on the Grenada side of the border yet. I think a big part of the reason behind the numerous nearby islands all issuing their own stamps is the fact that, since around 1988, St. Vincent has been a client of the Inter-Governmental Philatelic Corporation, or IGPC, a philatelic agency that represents over 70 different countries in the design, production, and marketing of postage stamps. It also assists postal administrations with the running of their postal services. IGPC claim to produce nearly half of the different postage stamps issued each year. The IGPC is particularly noted for the issue of stamps featuring popular thematic subjects, cartoon characters and individuals from sport and entertainment that have been criticized as having little connection with the culture or history of the issuing countries. The mass issue of stamps featuring images from American pop culture has even been called a form of cultural imperialism. A key development was obtaining the permission of the Disney company to use their cartoon characters on stamps during the 1979 International Year of the Child. Disney themed stamps have since become an important part of the company’s output. Grenada and St. Vincent and the associated islands may be the most prodigious issuers of IGPC-designed topical stamps. In my small mixed lot, two souvenir sheets featured Disney characters (one portrayed Mickey, Minnie, Donald Duck, etc. as teachers and students in various classroom settings so I didn’t mind so much). The souvenir sheet picturing a Concorde jet flying over the RMS Queen Elizabeth 2 is certainly attractive and it is certainly possible that the QE2 may have visited during one of its World or Caribbean cruises; I doubt if the local airport could handle a plane such as the Concorde, however. But what does Japanese painting have to do with the islands? And I cannot imagine penguins thriving in the Grenadines. 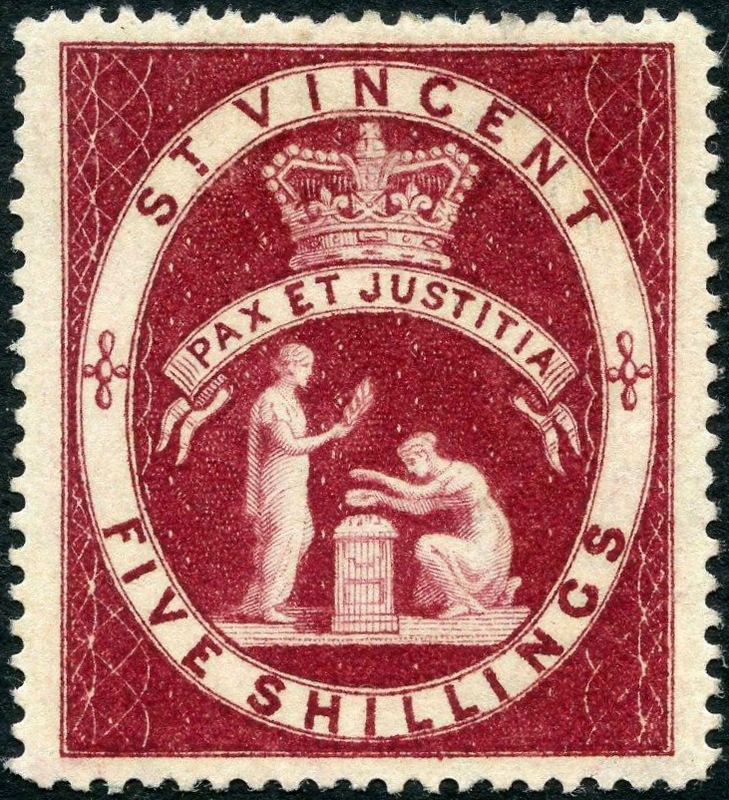 Two stamps featured the St. Vincent coat of arms, or as described in the Scott and Stanley Gibbons catalogues, the “seal of colony”. The colonial badge was in use from 1907 until 1979 and features two women in classical Roman dress. 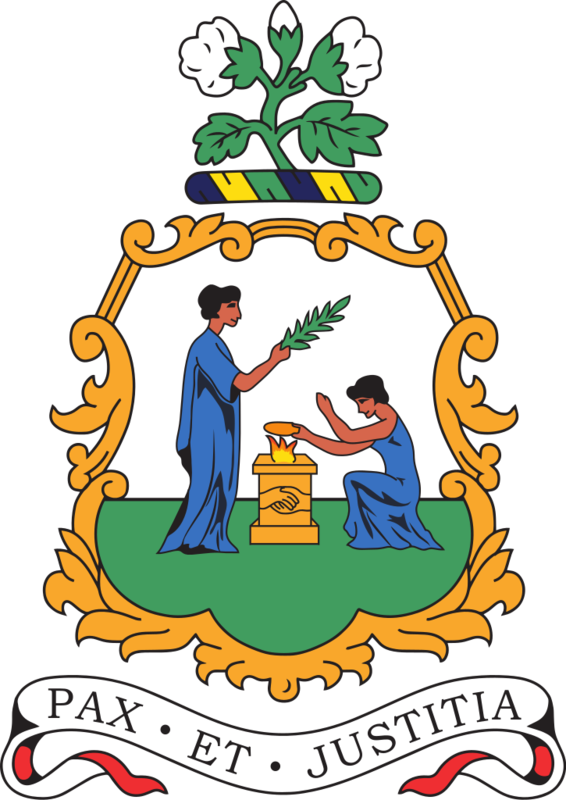 The one on the heraldic right stands holding an olive branch and the one on the left holds scales of justice and kneels before a gold altar situated between them. This was surmounted by a crown situated above a scroll reading PAX ET JUSTITIA, Latin for “Peace and Justice”. 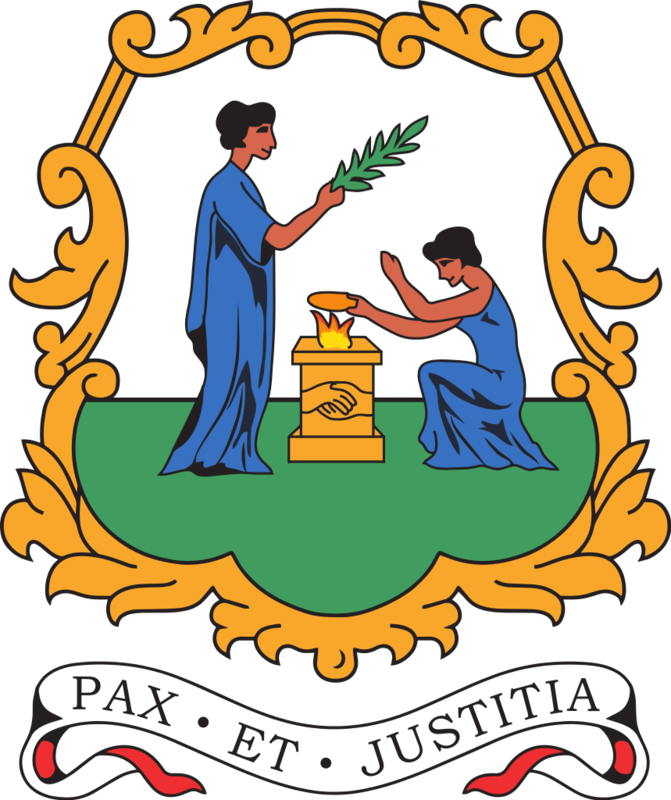 The current coat of arms of Saint Vincent and the Grenadines replaces the crown with a cotton plant. 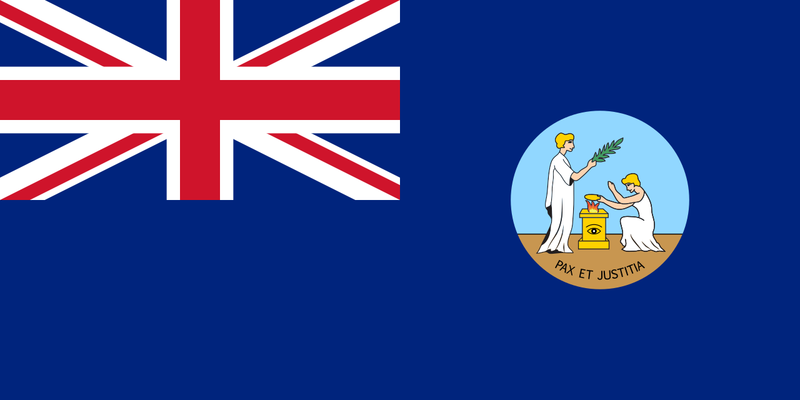 The Vincentian monarch – since October 27, 1979, Queen Elizabeth II — is today shared equally with fifteen other countries within the Commonwealth of Nations, all being independent and the monarchy of each legally distinct. For Saint Vincent and the Grenadines, the monarch is officially titled Queen of Vincent and the Grenadines, and she, her consort, and other members of the Royal Family undertake various public and private functions across the country. However, the Queen is the only member of the Royal Family with any constitutional role. 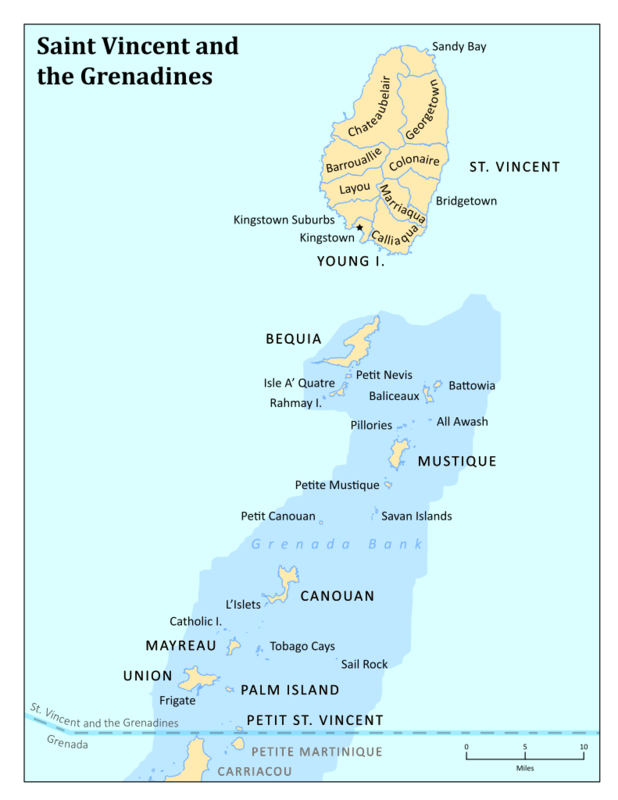 While several powers are the sovereign’s alone, because she lives predominantly in the United Kingdom, most of the royal constitutional and ceremonial duties in Saint Vincent and the Grenadines are carried out by the Queen’s representative, the Governor-General. 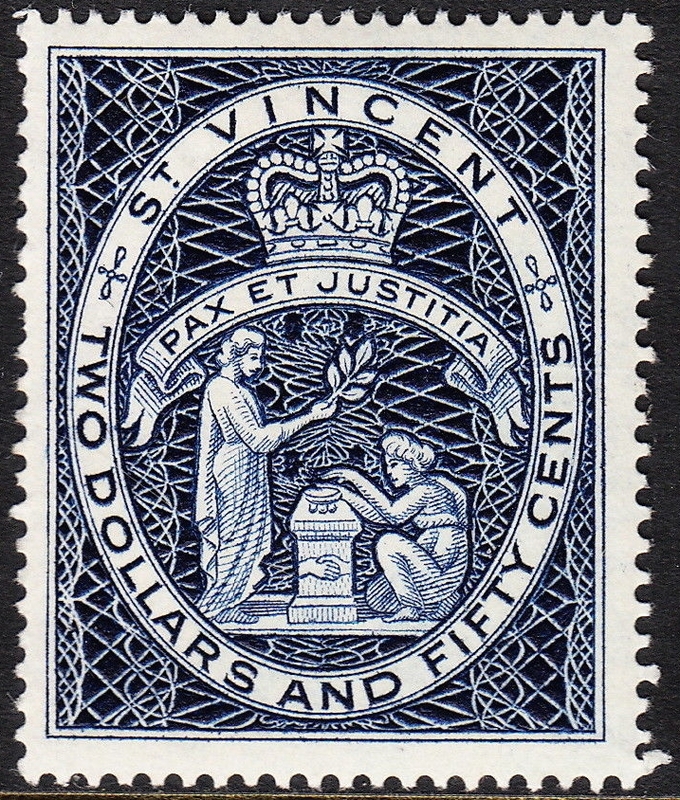 The first stamp issued by St. Vincent portraying the colonial badge was released in 1880 (Scott #29); my mixed lot included a copy of Scott #54 which is very similar in design (and worth a whole lot less). SScott #197 was released on September 16, 1955, again in a very similar design. Denominated at $2.50, the deep blue stamp is the high value in a set of 12 definitives (Scott #186-197). The stamps were recess printed with the lower values perforated 13×14 and the three high values perforated 14. I chose St. Vincent as the today’s “random stamp” entry not because of my recent purchase but because I happened to be listening to some music recorded by the indie rock/art work singer/guitarist Annie Clark who goes by the professional name of St. Vincent. Given the number of music-themed stamps put out by St; Vincent and her Grenadines, I am a bit surprised that there isn’t a stamp portraying the performer. Not yet, anyway.